Should Georgia’s foreign policy alignment be defined in the Constitiution? TBILISI, DFWatch–Two proposals to define Georgia’s foreign policy alignment in the Constitution were postponed by a parliament committee because not enough MPs showed up. The rebellious opposition leader who started the debate now claims parliament has violated election rules. The debacle began with a proposed constitutional amendment about ‘non-bloc status’, put forth by Nino Burjanadze, leader of the opposition party Democratic Movement. The proposal would prohibit Georgia from joining NATO or any other military bloc. It also calls for the removal of all foreign troops from Georgian territory, which means the removal of Russian soldiers from Abkhazia and South Ossetia. Burjanadze’s party is not represented in parliament, and the proposal would need to gather at least 200,000 signatures of support for parliament to consider it. At the procedures committee hearing August 23, another proposed constitutional amendment was also on the agenda, one put forth by Speaker of Parliament Davit Usupashvili in response to Burjanadze’s. The Republican party leader suggested adding a text in the beginning of the Constitution that it is the firm will of Georgian citizens to integrate in the Euro-Atlantic system of democratic states of security and cooperation. But his initiative also failed in parliament due to a lack of quorum. Burjanadze visited Moscow in the middle of August to discuss her initiative about non-bloc status with the head of the Duma. She said at a briefing after her visit that the Russian party ‘was quite interested’ in her initiative. Several Georgian members of parliament support the idea about non-alignment, for example Tamaz Mechiauri, who left Georgian Dream two months ago, but he thinks that it is not necessary to write it in the Constitution. 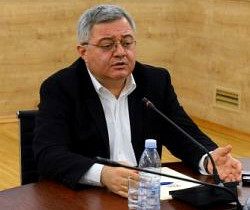 Usupashvili, whose proposal came as a response to Burjanadze’s, confirmed that his initiative is part of the election campaign. “Indeed this is a political initiative, and I am astonished about the comments that Usupashvili has this initiative because there is an election campaign. Tell me which parties or politicians aren’t engaged in the campaign today,” he said, adding that with this initiative, he wanted to tell people about the opinion of the Republican Party. 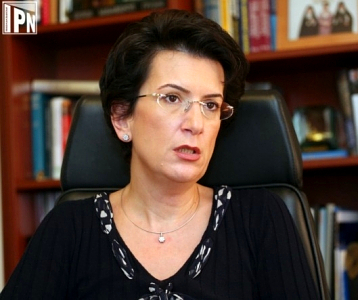 Burjanadze later accused parliament of violating election rules by deliberately sabotaging the committee meeting which was to have considered her initiative. The petition in support of her initiative was part of her party’s election campaign, she argued. 77 percent of Georgians voted in support of NATO membership in a referendum in 2008.